Strident men suits with olympian shoulders (hello Dynasty 80's), togs made of beef bits (um, ok Gaga), and fringed ponchos may come and go, but a WEARABLE well made and pleasingly girly frock is HERE TO STAY! I don't care who you are, this type of garment will be a loyal friend you shall revisit over the years. A staple along the lines of a durable trench or winter coat. 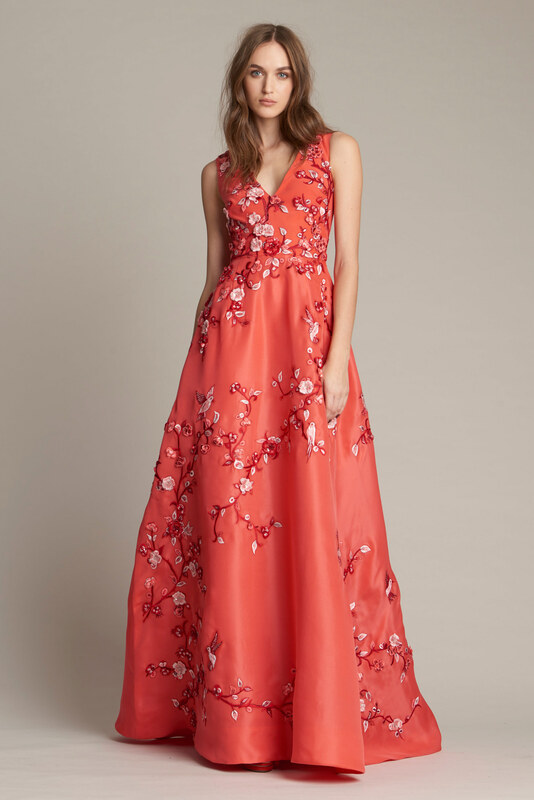 There will be a host of functions necessitating the appearance of THE DRESS, from the gala affair, to a wedding, to cocktails with the gals, or a bat mitzvah. And even if you're a fan of pants, leggings, and jeans (what can I say except, guilty as charged), sometimes you just want to look pretty. And who are we kidding, if you're trying to lasso yourself a man, a dress goes about a 100 times farther than a pant suit, even if major cleavage patrol is not involved.....its the Y chromosome, what are you gonna do? So, what better way to plunge into 2016 than jumping feet first into a bevy of festive and feminine frocks? 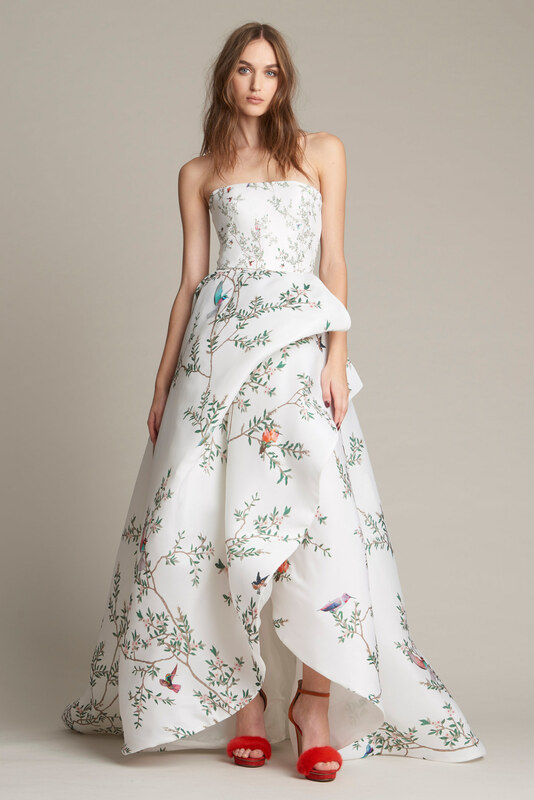 Lhuillier, known for her glamorous event dresses and gowns cleverly mixes the trends of the day, the bohemian folkloric, the flora and fauna motif (just look at Valentino and Gucci), and the ever beloved jacquards and LACE, into a lively, comely and intoxicating brew. A variety of silkens, gazer looming large and sculptural, in a host of silhouettes combine to form an assembly of stunning ready to wear. Above the knee, to the knee, midi and floor length options make an appearance to please all sensibilities. Lhuillier accomplishes some pragmatism, as many a piece in the collection could easily segue from work or afternoon activites to nighttime frolicking. Maybe just change your hair and jewelry. 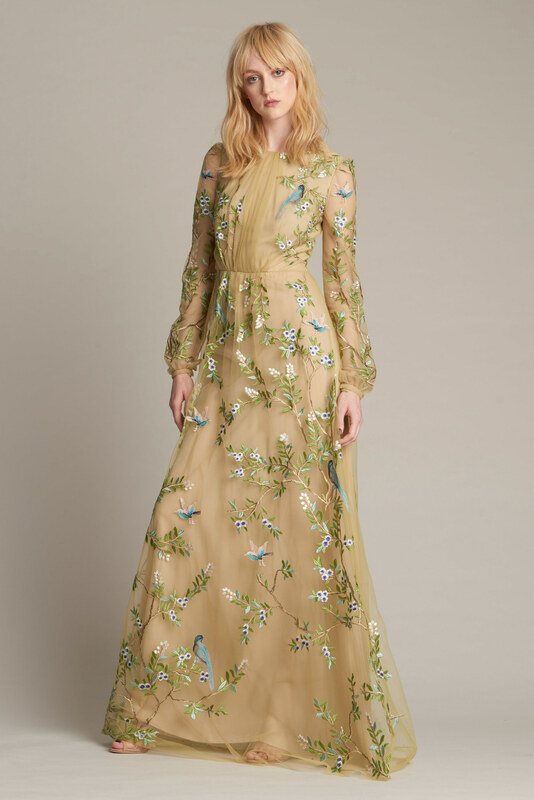 And for the Magpie contingent, sparkly opulence is infused throughout the collection in the form of intricate embellishments atop the shorter cocktail options and the floor length gala gowns. Not the easiest silhouette to pull off, just get out the high platform shoe-booties to lengthen the gams. The silk and guipure combo is a singular treat. Just scrumptious. Timeless in a deep vibrant red GUIPURE. More guipure in an easy flattering fit and flare silhouette. BOHO with a touch of Chinoiserie. The JACQUARD contingent. Always a lot of bang for the buck! Much visual interest yet light as a feather. CHINOISERIE options. Always alluring and glamorous. The LITTLE BLACK DRESS, for the Vixen amongst us! Floral embellishments…..will always GLAM up a simple shift or fit and flare silhouette. Yards of off white gazar decorated by our feathered friends and cherry blossoms, perfect for a spring gala or debutante ball (do these things still exist?). 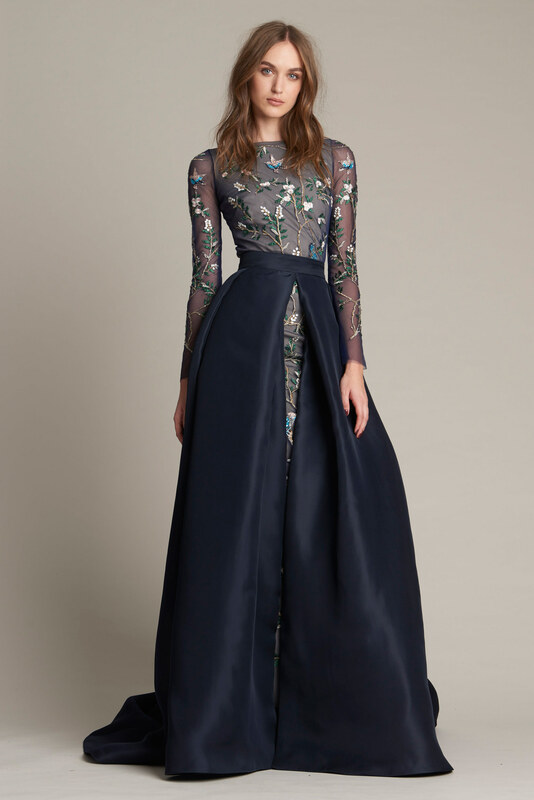 No self respecting collection of nighttime frocks would be complete without the floor length EMBELLISHED tulle component, thank goodness. And Lhuillier certainly provides some ravishing examples! ITS A NEW YEAR! Its time for a NEW DRESS!!!!!!!!! !